Sun is a great source for power generation. But what exactly is solar irradiance. How to measure this. But more importantly why should you measure irradiance in solar energy? 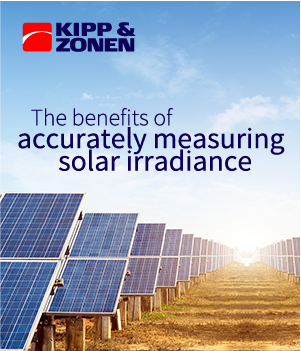 This whitepaper will inform you on the theoretical part of solar irradiance and how to measure it. But also why it’s important to measure it when you are working in solar energy. The whitepaper concludes with 6 applications to give you an impression of the possibilities and best practices. © Kipp & Zonen B.V. All rights reserved.